As our children grow, they are closely monitored by their pediatrician to ensure they hit all their developmental and growth milestones. However, older children who begin playing sports for their schools require a fresh clean bill of health from their doctor. Learn about school physicals and why they are important with your child’s pediatrician at Carolina Kids Pediatrics in Raleigh, NC. Is your child planning on playing any sports this school year? If so, the school will probably require your child to have a sports physical done before he or she can play. School and sports physicals help make sure that players are in good health before they play, in an effort to avoid injuries and the effects of other potentially harmful medical conditions. When visiting the doctor for your child's school & sports physical, you will need to bring your child's medical records, including a current copy of their immunizations record, a list of your child's known allergies and a list of any medications your child is on currently. You will also want to bring your insurance card and the physical form your child's school needs to have filled out. Be sure to write down any questions or concerns you may have ahead of time so you don't forget them during your appointment. Carolina Kids Pediatrics is committed to helping you keep your child healthy--both when your child is sick and when your child is well, and visiting Carolina Kids Pediatrics for a sports physical is a great way to make sure that your child is healthy enough to play sports and to solve any problems if he or she is not. Call and schedule your child's appointment today! 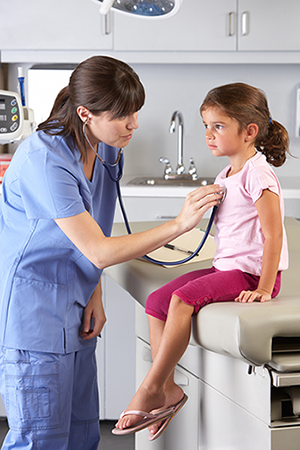 Did you schedule your child's annual physical exam yet? Carolina Kids Pediatrics offers school and sports physicals. Call our Raleigh, NC office at (919) 881-9009 for an appointment!